There was a commercial on TV last night that took me by complete surprise. It was for Spam burgers – with a video of a burger bun, thick slice of grilled Spam, topped with cheese, lettuce, tomato, onion, etc. A tasty alternative to beef burgers, I suppose. 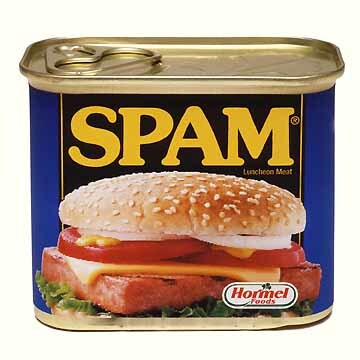 So today, being a complete lemming when it comes to media’s influence on this generation, I bought some Spam. Not just one can of Spam – I bought a four pack at Sam’s Club. This entry was posted in Deep Thoughts, Foodie, Movies & TV by Unsigned Podcast. Bookmark the permalink.